Indian School of Business in partnership with British High Commission is organising the Young Thinkers’ Conference at the Mohali campus. Young Thinkers’ Conference is the flagship foreign and security policy conference, which brings together the best and brightest experts and young thinkers to discuss a range of issues on 12th October. Building on the success of the two previous editions, Young Thinkers’ Conference is back in the city. The British Deputy High Commission and Indian School of Business will host the Young Thinkers’ Conference at the Mohali campus. The conference is structured as a panel discussion, each covering a thematic topic and moderated by a senior journalist. Panel 1: Climate Change & Energy Security: How to shape India’s Sustainable Development? Panel 2: Youth & Politics: What difference can they make? Panel 3: The Truth behind Fake News and how best to tackle it? 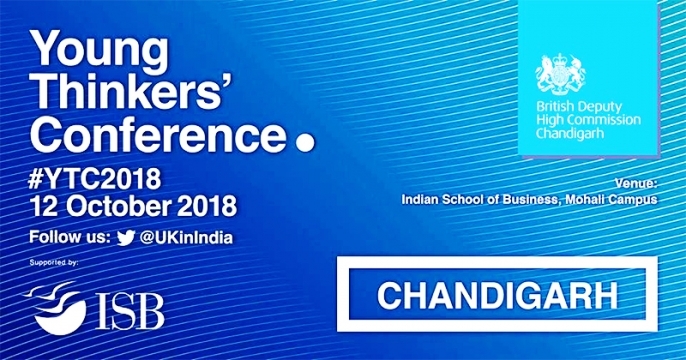 The #HashTag 'Young Thinker’s Conference 2018 @ ISB Mohali' appearing in #Mohali .